There is never really a good time to face Manchester City at the Etihad, but there is no worse time to face them then after an international break. For starters, City’s home form is formidable: they have only lost two out of their last thirty-eight home games in the Premier League. Given the effect international breaks tend to have on sides that travel immediately after them – as well as Tottenham’s much publicised struggles in attack – it seems unlikely that we will see an upset on Sunday afternoon. That said, one is not impossible. Manchester City have not been as dominant as one would have expected given how highly the majority of observers rated their transfer business this summer. Defeat on the road to Sunderland last time out was their fourth reverse in eleven matches this season. Furthermore, Vincent Kompany and David Silva will miss this match, so André Villas-Boas’s squad has to believe three points can be won. Manuel Pellegrini has taken a lot of flak for the stuttering start to his reign, but to say he is the reason for City’s struggles is simply inaccurate. As I have said on several occasions before, despite its enormous cost, Manchester City’s squad has been incoherently assembled and reconfigured. There has never been an obvious formation or system that simultaneously gets the best out of enough of their ludicrously talented players. 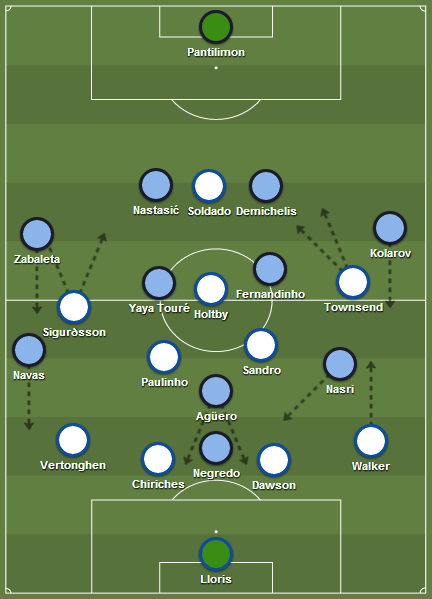 Each setup chosen by previous manager Roberto Mancini created as many problems as it solved. For example, when Carlos Tévez was flying, Sergio Agüero or Edin Džeko was playing in a role that did not suit them. Manuel Pellegrini’s reign has continued in much the same way: Agüero, David Silva and Yaya Touré have been exceptional at times and dismal at others; Jésus Navas has been largely disappointing; Joe Hart’s form, the best of which was always overrated anyway, has collapsed. There are mitigating factors, of course. City have suffered due to injuries and it takes time for a manager to turn a flawed system work into a working one. Nonetheless, it is hard to see them winning the title again any time soon. If it is Sheikh Mansour’s dream to win the Champions League, he is going to have to wait a long time for it to come true. Given that Manuel Pellegrini has continued to use Roberto Mancini’s rotation policy, it is difficult to predict with exact accuracy the City starting eleven, but their game plan will be familiar. They will keep the ball in deep midfield and delay playing it forward. This allows them to dominate possession but, equally, can work against them. When Samir Nasri receives the ball, for example, he will have to face a defence which has had time to organise, leaving him with little option but to return the ball from whence it came and watch as it goes out to the other flank. Unless Nasri or Navas make something out of nothing – a possibility that can never be discounted – City’s two forwards will be starved of service and limited in the number of runs they can make, due to their partner working in the same small amount of space. Costil Pantilimon seems set to continue in place of Joe Hart, which is something of a surprise. The Romanian has a real chance to stake his claim for a real run in the first team and a good showing here will go a long way towards cementing his spot. His height is his most obvious strength but makeshift defences are generally vulnerable to simple plays and it could be that a hopeful Tottenham ball into the box is enough to undo Manchester City. Pablo Zabaleta should play at right-back, having returned from Argentina’s double-header in the United States. Second choice to pseudo-bodybuilder Micah Richards in his first seasons in England, Zabaleta has since proved himself as one of the best full-backs around and his presence will go some way to easing City’s defensive worries. Less encouraging is the fledgling partnership between Matija Nastasić and Martin Demichelis: a player with huge potential but one who needs a decisive partner, and another who seemed past it so long ago that it was moderately surprising to see him identified as the man to play first reserve to Vincent Kompany. Neither are bad players, of course, but if Spurs can draw hope from anywhere, it is here. Whether or not Gaël Clichy or Aleks Kolarov starts at left back is something of an irrelevance, although if the latter plays it would be wise to avoid conceding free-kicks around the box. At the other end of the pitch, either can be exploited and it will be hugely frustrating to see AVB screw up his team selection and waste Tottenham’s third band once again. It is obvious that Aaron Lennon could be decisive in this game if played on the right: all AVB has to do is use common sense. The Yaya Touré/Fernandinho double pivot is one of Pellegrini’s certain picks and with good cause. While they are yet to dominate in the manner that they really should – and Yaya’s Berbatovesque attitude towards defending is finally drawing scorn from City’s increasingly irritated fanbase – the other options simply are not up to the standard. On the right, it seems likely that Jésus Navas will start, but James Milner is in with a shout according to many reports. They are very different players, of course, which makes it hard for Jan Vertonghen, assuming the Belgian starts at left-back, to prepare for his direct opponent. That said, Vertonghen would start as favourite against either, even if he would technically be out of position. In the absence of David Silva, Samir Nasri will act as the team’s primary creator. The former Arsenal playmaker had a truly miserable international break: he shouldered most of the blame for France’s 2-0 capitulation in Ukraine before being dropped for les Bleus’ unforgettable comeback in Paris. As previously mentioned, his role is not going to be an easy one. Moving on to the strikers, it goes without saying that Sergio Agüero is currently on fire, having scored thirteen in thirteen for City as well as netting twice for Argentina against Bosnia & Herzegovina on Monday night. What is perhaps frustrating for City’s fans is that it has taken him this long to fire on all cylinders again. As with so many of their players, his tactical instructions have often seemed to hinder his performances rather than enhance them. It must be said that the logic behind playing Agüero off of a target-man is obvious: it allows City to play with two strikers and he has the technical skills to link up with both the midfield and his strike partner. However, it denies the born poacher his most valuable resource: space in the penalty area. When sides park the bus against City, Agüero can go missing. If Spurs do manage to take Agüero out of the game, then Álvaro Negredo will be the man to whom City look to score goals. For all the money spent on strikers since Mansour arrived, it seems that this is the first time City have a talented target man who is also a genuine goalscorer. Negredo’s effect on the side and on Agüero in particular has been revelatory. Michael Dawson and Vlad Chiriches will have to keep their wits about them if Negredo is to depart the Etihad without a goal to his name. As far as Spurs’ team selection and strategy goes, there is not really a lot that can be said. It could be that they benefit from having to use a more reactive strategy but any positive result would be a genuine surprise. The only thing I would hope and pray for is an end to AVB’s experiments with two inside-out wingers: for the love of God, please make it stop. After all, if Tottenham can make their attack coherent, anything is possible.